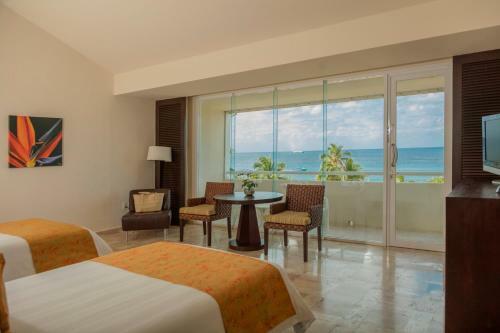 With half a mile of white sandy beach overlooking the world's second largest coral reef the Presidente Intercontinental Cozumel provides an intimate elegant island escape for our guests. This 220-room hotel on five floors offers rooms with pool or ocean views. All rooms have high-speed internet access a mini-bar flat-panel TV a balcony or terrace and lots of little touches like robes hanging in your closet. Three restaurants indulge your taste buds and the resort offers two outdoor pools — one for adults only one for families — two lighted tennis courts a children's club dive center 24/7 fitness center and a full-service spa. Snorkeling is available on one of the world's largest coral reefs right off the beach. Pets are allowed with some restrictions and valet parking is available Presidente Intercontinental Cozumel is four miles from downtown Cozumel and six miles from Cozumel International Airport. Trips to Cancun Chichen Itza and Tulum can be made from the resort. discover all that San Miguel De Cozumel can offer you!